Michelle Obama continued to defy expectations yesterday, not only in the style stakes (impeccable yet again) but by breaking royal protocol, in the nicest possible way! The American First Lady took the unusual step of hugging the Queen, as she accompanied her husband for a formal reception at Buckingham Palace. 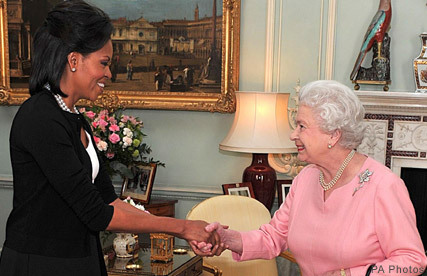 The move is considered a departure from the formal protocol, but it clearly didn’t bother Her Majesty, as she promptly reciprocated the gesture, placing her arm around Mrs Obama. 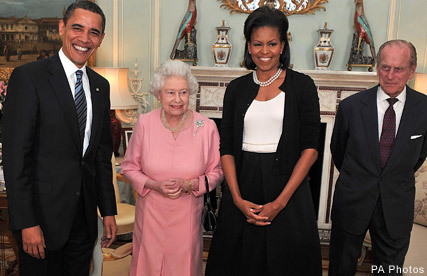 Earlier in the day the Obamas met the royals for the first time, and presented them with gifts including an engraved iPod, which featured videos of the monarch’s last state visit to Washington, in 2007. The royals in return gave America’s first couple a silver-framed, signed photograph of themselves. Following the meeting, the Obamas were ushered to meet Prime Minister Gordon Brown and his wife Sarah, who escorted them to a dinner at Downing Street for the G20 leaders. Cementing her status as the First Lady of Fashion, Mrs O continued to roll out the fashion hits, and wore a monochrome Isabel Toledo dress, and an Azzedine Alaia black cardigan for the evening. She wore the same dress to the palace, but added an A-line coat by one of her favourite designers, Jason Wu. The evening saw Mrs Brown host the cream of British female talent, with J.K. Rowling and Dame Kelly Holmes taking seats either side of the American First Lady. They enjoyed a British themed dinner of Scottish salmon, Welsh lamb and Bakewell tart, prepared by Jamie Oliver.